Until about 1980, most anthropologists assumed that humans formed a distinct lineage from the great apes, with forms such as Sivapithecus being placed on the direct line to humans. The split between apes and humans was dated at 15-25 Myr ago, thus in the late Oligocene or early Miocene. This view was challenged dramatically by the findings of molecular biologists. Early attempts at protein sequencing (see pp. 34-5) in the 1960s and 1970s showed that humans were much more similar to chimps and gorillas than had been expected, and the branching point was dated at about 5 Myr ago (range of estimates, 9-4 Myr ago). At first, these dates were regarded as gross underestimates by anthropologists, but tests of the phylogenies using a dozen different proteins and the nucleic acids (DNA, RNA) produced comparable results (Goodman et al., 1998). 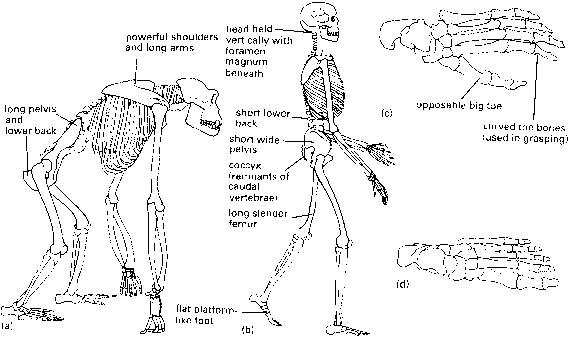 The relatively late split of humans and apes was confirmed in the 1980s and 1990s by restudy of existing ape fossils, and by collection of new specimens of Proconsul, Dryop-ithecusand Sivapithecus which showed they were side branches from the line to modern apes and humans. 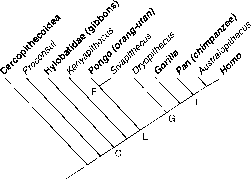 In a cladogram of the apes (cladogram (a)), most anthropologists accept that Proconsulidae is the basal taxon, followed by the gibbons (Hylobatidae) and then the great apes and humans, Hominidae (Andrews, 1992; Delson et al., 2002). Within the great ape clade, the molecular evidence has shown repeatedly that chimps are closest to humans, then gorillas and then the orang-utan. This view is widely accepted, even though morphological support seems stronger for an African great apes clade: chimps and gorillas share numerous characters that are absent in modern humans, such as thin enamel on the teeth, an enlarged trigonid basin on the lower molars, six sacral vertebrae and ten adaptations for knuckle-walking (Andrews, 1992), but these are presumably convergences or were present in the last common ancestor. Soft-tissue characters, on the other hand, support the molecular phylogeny shown here (Gibbs et al., 2000). Most anthropologists accept that Kenyapithecus and relatives are basal hominids, perhaps followed by the Ponginae (Sivapithecus + orang-utan) and then perhaps the dryopithecines (Begun et al., 1997), although the latter has also been associated with the Ponginae. When this cladogram is expanded into a phylogenetic tree by the addition of fossil evidence (diagram (b)), it becomes clear that Proconsul is a generalized hominoid, that the ramamorphs evolved side by side with the orang-utan in Asia and that humans are part of an African ape group that has had an independent history only since 9-7 Myr ago. Relationships of the living apes and humans: (a) cladogram showing postulated relationships, based on Andrews (1992), Moya-Sola and Köhler (1996), Goodman etal. (1998), Delson etal. 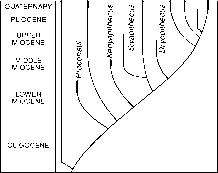 (2002) and others; (b) phylogenetic tree of the living and fossil apes and humans. Synapomorphies: A CATARRHINI, sexual dimorphism is marked, males have larger canines than females; B HOMINOIDEA, relatively large brain size, low-crowned lower premolar 3, tail absent, scapula with elongate vertebral border and robust acromion, humeral head rounded and medially oriented; C, enlarged sinuses, palate deep, middle incisors spatulate, lower molars broad with low rounded cusps, clavicle elongated, very long arms relative to legs, broad sternum/broad thorax, short olecranon process and reduced styloid process on ulna, ulna shaft bowed, radial head rounded, hand with long curved proximal phalanges with distally-placed flexor insertions, opposable thumb, femur with asymmetrical condyles, iliac blade broad, calcaneum short and broad; D HOMINIDAE, maxillary sinus enlarged, orbits higher than broad, lengthened premaxilla, nasals elongate, narrow incisive foramen, subarcuate fossa in petrosal bone absent, incisors enlarged, upper incisor 2 spatulate, canines robust and long, molars with thick enamel, Y-5 molar, ischial tuberosities absent, hindlimbs reduced in length; E, zygomatic arch robust with a rugose top and three foramina; F PONGINAE, narrow interorbital pillar, orbits high and narrow, great size discrepancy between upper incisors, alveolar prognathism; G, synapomorphies to be determined; H HOMININAE, facial klinorhynchy (downward bending of the face on the braincase), enlarged continuous supraorbital torus (eyebrow ridge in skull), frontal sinus, adaptations for knuckle-walking, fusion of os centrale in wrist; I, premaxillary suture obliterated in adults, premaxillary alveolar process very elongated, nasal premaxilla very short, upper incisors all similar in shape; J HOMININI, bipedal posture, relatively long hindlimbs, basin-like pelvis, foramen magnum located forward in skull, large brain relative to body size, small canine teeth, U-shaped dental arcade. teeth and jaws from Kenya, was a 1-m-tall animal that climbed trees and lived on the ground. There is growing evidence about the history of the Ponginae. 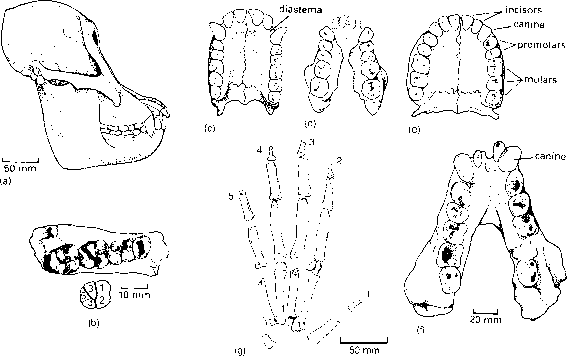 A new species represented by a lower jaw from the upper Miocene of Thailand, Khoratpithecus (Chaimanee et al., 2004), shares characters with the modern orang-utan and suggests a long independent history of pongines in south-east Asia. moved on all fours both in trees and on the ground, or perhaps some species were adapted for climbing and suspension, and others for quadrupedal locomotion (Moya-Sola and Köhler, 1996). Until about 1980, Sivapithecus was generally regarded as being on the line to humans, a view confirmed by a superficial comparison of palates (Figure 11.5(c-e)). Apes have a rectangular dental arcade, humans have a rounded tooth row, and the palate of Sivapithecus seems to form a perfect intermediate. The wider anatomical evidence, however, confirms that Sivapithecus is related to the orang-utans. and Ankarapithecus from the upper Miocene (11 Myr ago) of Turkey. Gigantopithecus from the late Miocene (?) 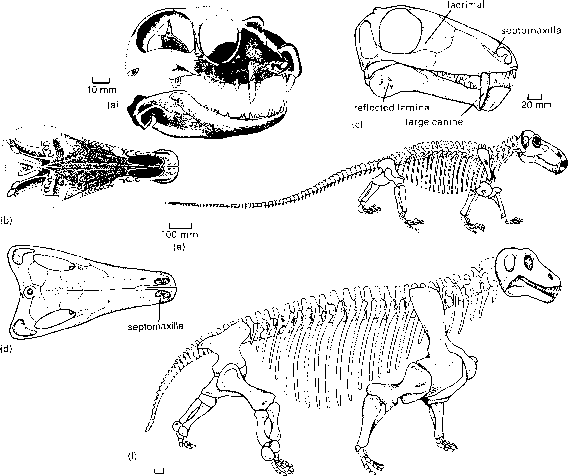 of India and the Pleistocene of China was a possible late-surviving ramamorph, one of the most astonishing primates. Gigantopithecus must have been monstrous and had massive heavily worn teeth (Figure 11.5(f)). It was ten times the size of Sivapithecus, and adult males might have reached heights of 2.5 m and weights of 270 kg. This huge animal stalked the forests of southeast Asia from 5 to 0.3 Myr ago and some regard it as the source of stories of yetis in Central Asia and the big foot of North America. in the upper Miocene (10-7 Myr ago) of Europe, from Spain (Moya-Sola and Köhler, 1993,1996) to Hungary (Kordos and Begun, 2001). Dryopithecus was adapted for suspension beneath branches and it probably swung rapidly around the subtropical forests of southern Europe. The arms, and in particular the hands (Figure 11.5(g)), are long, and the thumb and finger bones indicate that there were strong grasping muscles. Dryopithe-cus lies somewhere in the cladogram between Proconsul and the modern apes, but its precise affinities are hotly debated (see Box 11.3). Other European genera, such as Oreopithecus (8 Myr ago) and Graecopithecus (9-8 Myr ago),may fall close to the dryopithecines, or the latter might show affinities with gorillas. Gorillas and chimps have no definite fossil record, but this is far from the case for the third extant group of African apes, the humans. What is a y5 pattern teeth? Do orangutan have y5 molar?